Cows provide us with meat, milk and leather -- they're integral to many facets of human existence. Cows and male cattle alike have four stomachs, which allows them to draw as much nutrition as possible out of everything they consume. These hardy animals can survive in a variety of habitats and environments as long as they have enough vegetation to eat. Our domesticated cattle -- female heifers and cows, and male bulls and steers -- as well as bison and oxen often live in grasslands. They spend parts of the day grazing on grass. A cow wraps her tongue around the grass and breaks it off with her lower teeth. After it passes through two stomachs, she regurgitates the cud, chews it again and swallows it down into her third stomach. Same with male cattle. Cattle serve an important purpose in the grasslands because they can quickly trim large areas of tall grasses. These tall grasses can harbor pests and easily catch fire, but shorter grass is less likely to. 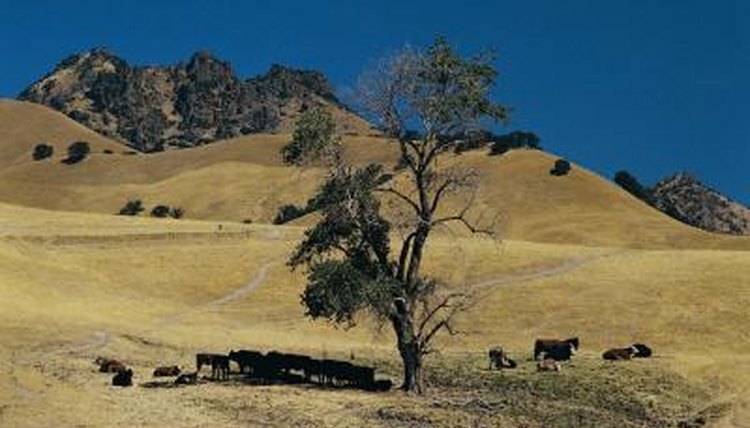 Feral cows, or the wild descendants of domesticated cows, live in forested areas when grasslands aren't available. This is a problem in many countries, including areas in the United States, Ecuador, New Zealand and Samoa. These cows can quickly decimate a forest, trampling plants and eating saplings, ferns and shrubs. This keeps new trees from growing to replenish those that are cut down, fall or die from disease. It also disrupts the existing ecosystem, forcing other animals to seek new homes. Domesticated cows tend to be confined to large, fenced pastures. These cattle ranches often have barns where the cows spend part of their time, but most are allowed out to graze the pastureland much of the day. They eat the grass and other herbaceous plants, but farmers typically have infrastructure in place to keep the cows from decimating the land. Most rotate cattle to different pastures periodically, giving areas time to recover from grazing before the grass is killed off. Domesticated cattle aren't native to the United States, although the bovine American bison species is. Domesticated cattle were introduced to North America by the Spanish in the 1500s; others were imported into the Colonies in the 1600s. Bovines exist in countries around the world, either domesticated or wild, covering most of the continents. In addition to North America, cows live in areas of South America, Europe, Africa, Asia -- particularly southeast Asia -- and Australia.